Friday Tyrone Hampton was born on August 18, 1954, in Pensacola, FL, to Wade Hampton and Willie Jean (Cole) Hampton. He co-founded Peace of Wisdom Ministries in Santa Barbara, CA. As president of the Board, he directed the ministry and coordinated activities and films via the Santa Barbara African Heritage Film Series. During a time when African Americans were fighting for Civil Rights, Friday, was involved in numerous protests, marches and sit-ins within his Alabama community. Mr. Hampton served in the United States Army as a Service Coordinator, receiving a National Defense Service Medal, an Expert Badge in Combat Training and an honorable discharge. 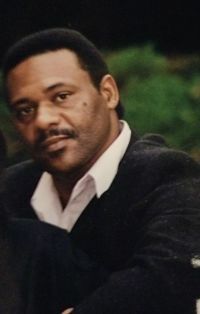 He worked for the U.S. Defense Contract Audit Agency in Los Angeles, CA where he received numerous service awards including over 10 Years of Government Service, as an Equal Employment Officer, and as a liaison between the community and the Long Beach Police before locating his family to Santa Barbara, CA. In our community, Friday became the Director of Computer Services for the Unity Shoppe, developing residents in job and computer training. He was known for encouraging and inspiring many people. Minister Friday is survived by his wife Rev. Gwendolyn Hampton; son Emmett Wade (Deji); daughter Starla; father Wade Hampton (Willie Jean deceased); two brothers, one sister, four sister- in-laws, grandchildren: Deja, Kaya, Kristofer, and Devin; and a host of aunts, uncles, nieces and nephews. Friday had two sons, Christopher Wesley Hampton (infant) and David Sterling Hampton (23) and two brothers that preceded him in death. Friday went home to be with the Lord on Thursday, December 21, 2018 in Santa Barbara, CA. A memorial is planned for Saturday, January 19, 2019 at 1pm at Veronica Springs Church, 949 Veronica Springs Road, Santa Barbara, CA 93105.